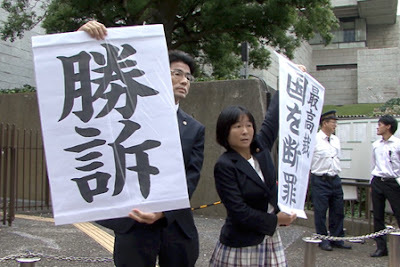 This is a documentary that follows ten years in the fight to get justice and compensation for the people of Sennan, Osaka who were put into harm’s way by not only working for the various companies that made asbestos but lived around the factories themselves. After almost a hundred of exposure thousands are sick and dying but no one is paying attention. It was a danger that the Japanese government knew about well before the Second World War but chose to willfully cover up the fact. I’m going to mention that Sennan Asbestos Disaster runs almost four hours to start because the extreme running time maybe a factor in whether you decide to see it. I also mention it because I was lucky enough to be able to watch the film at home at my leisure so I got to stop and start the film as needed. Don’t get me wrong this is a very good, probably great, film but there is a lot of information and it can be a bit overwhelming. Decidedly not a neutral telling of events, Sennan Asbestos Disaster wears it’s heart on the sleeve and the filmmakers are very much part of what transpires.This is a blood brother to director Kazuo Hara earlier The Emperor’s Naked Army Marches On. Frankly the fact that the film covers so much time and makes so many of the victims out to be real people it would be hard for the filmmakers to disappear into the background. They are on the front line from start to finish whether the government and company officials like it or not. While normally one would like a sense of distance, in this case there is no way to really side against those fighting for compensation, after all everyone knew there were problems 80 years ago, they simply refused to let anyone know. There is not mitigation. I like Sennan Asbestos Disater a great deal but it is a long film. As I mentioned above I got to take time away from my viewing of the film. I think that helped my connecting with the film and allowed me not to get overwhelmed to the point my eyes glazed over. While I heartily recommend the film when it plays this weekend at Japan Cuts, I think you should consider the run time before you dive in. For ticket and more information go here.